Even in today's ever-evolving world of technology, one thing is for certain: people cling to beloved tools and methods when it comes to their tech habits. AppSheet doesn't want you to have to learn a new product or get accustomed to new ways of organizing your data. That's why we host a variety of popular platforms, like Google Drive, Dropbox, Box, and Smartsheet. We're excited to announce you can now sign in to AppSheet from your Office 365 or OneDriveaccount. We're also working on an add-on for Excel online so you can have direct access from your spreadsheet to build a mobile app in minutes. A few weeks ago AppSheet spoke to the Office 365 International User's Group, and demonstrated how to make an app instantly from data housed on Office 365. The meeting's audio can be found by clicking the link above. 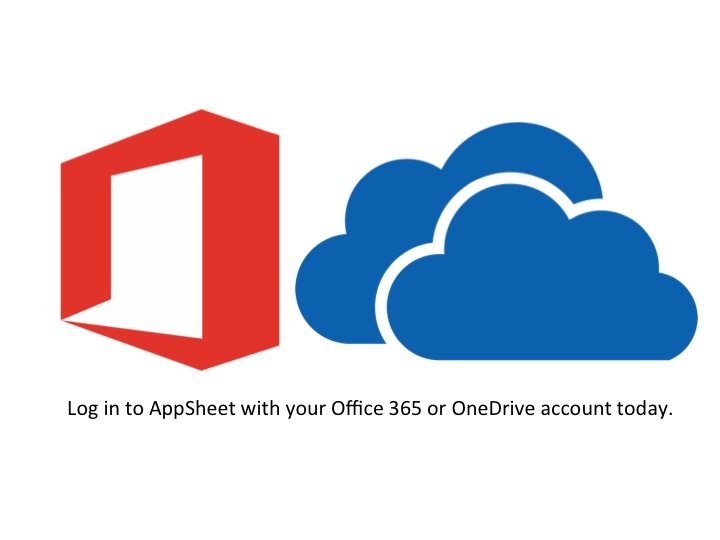 Try AppSheet out from your Office 365 or OneDrive account today!